Now that I've completed a couple of projects with redwood, I thought I'd share what I've learned. Especially if you choose redwood with any figure, planers and jointers will introduce chipping and tearout. 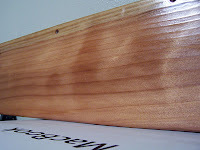 Redwood is a brittle softwood, and does not respond well to high speed tools. Instead of a planer, use a hand plane. Instead of a jointer, use a table saw with a sharp blade. Redwood grain lines are much harder and denser than the wood in between. If you sand with a typical finish sander with a padded base, you will find the wood between the grain lines to sand down much more quickly than the grain lines themselves. After discovering this while making my floating shelves I had a decision to make. Do I want to try to get the shelves perfectly smooth or work with the grain. A test board smoothed out nicely with sandpaper attached to a shop made wooden sanding block. But I rather liked the slight raised pattern caused by the softer wood sanding down between the grain lines. So I ran with it. Redwood color can vary widely from a deep maroon to a light tan. While all heartwood will darken with age or exposure to sunlight, the pale sapwood will not. If you leave sapwood in your workpiece be mindful of the fact that it will stay pretty much the same color while the red heartwood darkens over time. Also, there are wide variations in the color of the heartwood. The wood at your store is usually adequately aged so you have a good idea of the color the wood is capable of and where it will end up after aging. Working the wood removes the darker aged color, and it can then be difficult to determine what the color will be. Choose your wood by color, and if you are purchasing different shades of heartwood at the same time, save working the wood until right before your project, and somehow mark the wood after it's been worked to keep the colors separate. I'll finish with finishing. I use shellac on redwood whenever possible. Shellac provides a better "lensing" of the highlights in redwood than poly. Many coats, sanding with 400 grit paper after every second coat, gives the best finish. On the floating shelves I had planned to use polyurethane because of the wet environment of a bathroom. But after seeing the results from the small shelf, making a test piece with the poly, and comparing them, I found the shellac to be MUCH nicer. Six coats, a couple coats of paste wax, and the shelves were ready. I hope this helps you to explore redwood. The warm colors, distinctive grain, and specular highlights under shellac, all combine to provide you with a beautiful material for your next project. Thanks for these posts on working with Redwood. I have been planning a significant project with redwood (which I have never used before) and I am glad to know a little more about it going in.